It is not contrary to fact that for many years, there were a number of oppositions' demonstrations in front of Ethiopian Embassy in Washington DC. 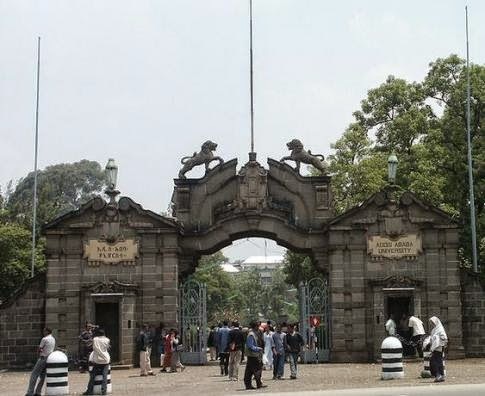 But there was no positive response from both the regime centre Addis Ababa and the assigned diplomats in DC. 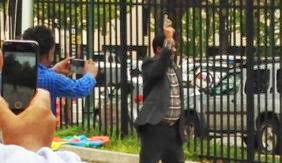 It was also painful as citizen, to see not even accepting demonstrators' formal complain letter by the Embassy's guard.Such a diplomatic mission's act has created a great discomfort and anger among Ethiopian community in DC. Since Andargachew Tsige, secretary of Ginbot 7 opposition movement hijacked at Yemen Airport and detained in Ethiopia, Ethiopians temper against TPLF is dramatically goes up. Determination to bring a true democracy is reflected in all young generation both domestic and abroad. Serious appeal to the regime from citizens has magnified. Yesterday Sep.29,2014, Ethiopian demonistrators entered to their own Embassy and shifted the flag with EPRDF star by the flat one. 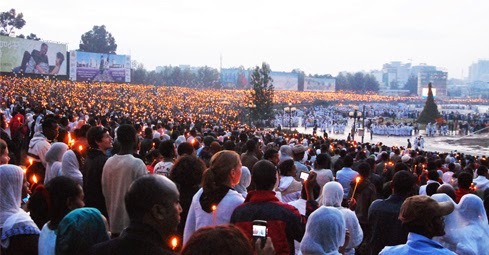 But here the bad thing was that an Embassy's response to the request of demonstrators who have carried the reflection of million Ethiopians was undermined.The demonstrators voice of ''release bloggers! freedom now! don't kill us!'' was treated by shooting which was also terrorised Washington DC. This was happened by Embassy's staff in Washington DC. Some released news are confirming as he is a prominent member of TPLF.Another shame to the current regime could be visible even at immediate door of White House. Now it is time to critisize critically Mr. Barack Obama's Africa policy, specially on Ethiopia. Last week, Mr.Obama was discussed with Ethiopian PM H.Desalegn and other current regime officials in Washington Dc. This was happened disregarding all violation of Human Rights by TPLF in Ethiopia. No body will have doubt as Presdant Obama is with a full information of his ''partners'' (current regime of Ethiopia) have detained bloggers, Journalists and activists on one hand, and on the other hand terrorising the Ethiopian people as a whole. As soon as the meeting ended, many Ethiopians including Professor Alemayehu G. Mariam who teaches political science at California State University, San Bernardino and a practicing defines lawyer opposed Mr.Obama's ignorance of Ethiopian people by not standing on the side of truth. This was explained under his article ''Shame On Me For Being Proud of President Obama!''. It was surprise event, not only for any political observer but for ordinary Ethiopians in Addis Ababa, to see a clear-cut of division between Europe and USA on the same country Ethiopia and the same week of last week. Last week , when Mr.Obama was discussing to PM H.Desalegn in Washington DC, European Union parliament prominent members and human right activists were making deep-rooted discussion on TPLF's bad Human Right records. Andargachew Tsige's kidnap from Yemen, the detention of Zone 9 bloggers, the winner of 'The Golden Pen Award of freedom'- Journalis Eskindir Nega (who is still in prison in Ethiopia) and others were a front issues which were discussed with in this particular special parliamentary meeting. Last but not least, yesterday's incidence of Ethiopian Embassy in Washigton DC controlled by oppositions and activists who have demanded ''freedom now! release all political prisnors !! Do not kill us in Gambella! etc'' is not just appeared from empty base. It is a result of more than two decades of non-humanitarian act of the regime.No body shouldn't be in doubt as this is a 'red light' for those who have ignored Ethiopian oppositions voice. It is also quite right to raise a critical question like -Is it not a right time to evaluate Mr.Obama's Foreign policy of Africa (specially to Ethiopia)? Here we shouldn't forget as the beloved president Obama was a good witness of hearing Ethiopians Human Rights problem in open public meetings. Remember Ethiopian Journalist Abebe Gelaw's official request of the president and international community to take serious measure on Ethiopia's human right condition. በመጨረሻም አንድ ነገር ማንሳት ይቻላል።ባራክ ኦባማ ከአቶ ኃይለማርያም እና ከከፍተኛ ባለስልጣናት ጋር ቁጭ ብለው ካወሩ ገና ሳምንት ሊሆነው ነው።የዛሬው በመዲናቸው ውስጥ በሚገኘው የኢትዮጵያ ኤምባሲ ተቃውሞ ያሰሙ ኢትዮጵያውያን ጉዳይ ለኦባማም ጭምር የሚያስደነግጥ ነው። የኦባማ የአፍሪካ ፖሊሲ ዕውን በጥናት ላይ የተመሰረተ ነው? ላለመሆኑ ማሳያው የዛሬው ጠንካራ ተቃውሞ ነዋ! ግማደ መስቀሉ ወደ ኢትዮጵያ እንዴት መጣ? የመስቀል በዓል እንጨት ተደምሮ እሳት ተቀጣጥሎ ለምን ይከበራል? 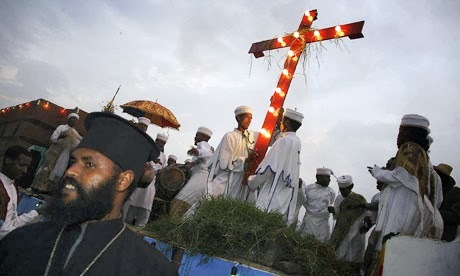 ለመስቀሉ መገኘት የሮሙ ንጉስ ቆስጠንጢኖስ እና የንግስት ዕሌኔ ሚና ምን ነበር? ግማደ መስቀሉ ወደ ኢትዮጵያ እንዴት መጣ?